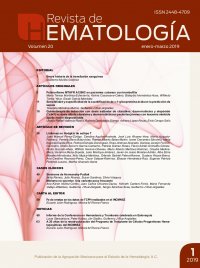 Home The report on the Conference on Hemostasis and Thrombosis in Slovakia. The report on the Conference on Hemostasis and Thrombosis in Slovakia. Rev Hematol Mex. 2019 January-March;20(1):60-62. 1 Department of Hematology and Transfusion Medicine, Comenius University in Bratislava, Jessenius Faculty of Medicine in Martin, Martin University Hospital, Martin, Slovak Republic. 2 Centro de Hematología y Medicina Interna de Puebla, Puebla, México. During 24-26 May 2018, the XXVth Slovak-Czech Conference on Haemostasis and Thrombosis in Hotel Victoria, Martin, Slovakia was organized. The Organization Committee is alternatively led by the presidents of the Slovak Society on Hemostasis and Thrombosis of the Slovak Medical Society and the Czech Society on Thrombosis and Hemostasis of the Czech Medical Society of Jan Evangelista Purkyně. The conference is held alternatively in Martin, Slovakia and Hradec Kralove, Czech Republic. The goal of the conference is to make a review of the most recent advances in hemostasis and thrombosis in the form of presentations provided by the national and international guests. The comprehensive program of the event was divided into sessions according to the topics including physiology and patophysiology of hemostasis, rare bleeding disorders, hemophilia and acquired hemophilia, inhibitors of the coagulation factors and immune tolerance induction, inherited fibrinogen disorders, von Willebrand disease, heparin-induced thrombocytopenia, inherited and acquired thrombophilic states, management of thromboembolic complications with direct oral anticoagulants (DOACs), vascular medicine, hemostasis in malignant diseases, disorders of platelets in the etiology of thrombophilia (session dedicated to the sticky platelet syndrome [SPS]), laboratory testing of the disorders of hemostasis, monitoring and multidisciplinary approach to hemostasis (including the questionable issues in hemostasis and anesthesiology and intensive care, and cardiology). 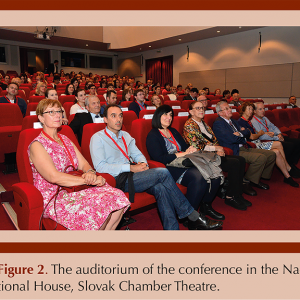 The Opening Ceremony of the conference took place in the National House, Slovak Chamber Theatre. It was opened by the presidents of the Slovak and Czech society on hemostasis and thrombosis – Peter Kubisz, prof., MD, DSc and Jaroslav Maly, prof., MD, PhD (Figure 1). This was also the opportunity to award the honorable guests for their achievements in the research of hemostasis-Guillermo J Ruiz-Argüelles, prof., MD, FRCP (Glasg), MACP, DSc (hc), Emmanuel J Favaloro, prof., BSc (Hons), MAIMS, PhD, FFSc (RCPA), Alessandro Casini, MD and Rosanna Asselta, prof., PhD. Totally, 73 lectures including prestigious Jessenius lecture (it was named after the worldwide famous physician and performer of the one of the first public autopsies in Europe Jan Jessenius coming from Turcianske Jaseno near Martin, Slovakia). The program included postgradual presentations, satellite symposia and poster session, as well. Interesting was the possibility of the postgradual students of the Jessenius Faculty of Medicine in Martin to present the results of their dissertation theses. 300 people attended the conference (the auditorium is illustrated on the Figure 2). All the presenters highlighted the importance of the detailed diagnosis enabling effective management of bleeding and thrombophilic disorders and underlined the need for cooperation in terms of the multidisciplinary approach to the hemostasis and targeted treatment based on the results. The novel treatment options for hemophiliacs were introduced by the specialist in the area of hemophilia Paul LF Giangrande, prof, BSc, MD, FRCP (Lond, Edin & Ireland), FRCPath, FRCPCH (Oxford, United Kingdom of Great Britain and Northern Ireland). One of the unique features of the conference was the honorable Jessenius lecture presented by the recognized specialist in the laboratory methods used for the diagnostics of bleeding and thrombotic disorders – Emmanuel J Favaloro, prof, BSc (Hons), MAIMS, PhD, FFSc (RCPA) (Sydney, Australia) dedicated to the laboratory diagnosis of von Willebrand disease. The attendants had also the possibility to learn about statistics and availability of providing the coagulation factor concentrates for the individuals with bleeding disorders provided by the representant of the General Health Insurance of the Slovak Republic. The part of the program dedicated to the SPS was considered as very interesting, confirmed by the prolonged discussion. Presenters provided the review of the history, epidemiology, diagnosis, genetic background of the syndrome, as well as the treatment of the pregnant women with SPS. Professor Guillermo J Ruiz-Arguelles, MD, FRCP (Glasg), MACP (Puebla, Mexico) introduced the situation in Mexican population. In the lectures of Alessandro Casini, MD (Geneva, Switzerland) and Rosanna Asselta, prof., PhD (Milan, Italy), the correlation between the genotype, prognosis and clinical manifestation of the subjects with inherited bleeding disorders was presented. Lubica Rauova, MD, PhD (Baltimore, USA) reviewed the problematic of the heparin-induced thrombocytopenia. European guidelines of perioperative prophylaxis of venous thromboembolism as the topic of one of the lectures were further subject for discussion. Researchers from the Department of Internal Medicine I with the cooperation with the Department of Hematology and Transfusion Medicine introduced their results of the monitoring of the effectiveness of the antiplatelet agents in the individuals with acute coronary syndrome. At the occasion of the Closing Ceremony of the conference, the presidents expressed their hope to continue in the Slovak-Czech meetings by the preliminary invitation to the further meeting dedicated to thrombosis and hemostasis planned to be organized in Hradec Králové, Czech Republic in May 2019. The authors sincerely hope that the program of the conference provided the inspiration for the continuation of the clinical practice and scientific/research work.